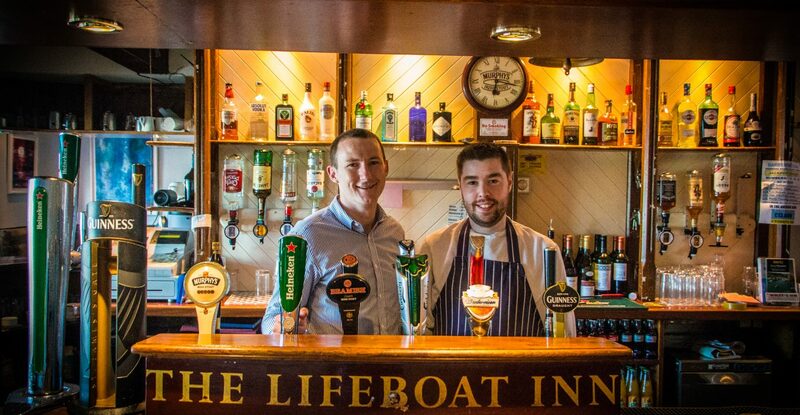 The Lifeboat Inn is a seaside gastropub Located on the Wild Atlantic Way in Courtmacsherry, West Cork. Irish produce takes centre stage in a wholesome menu which includes locally caught seafood as well as the finest meat and poultry which is also sourced from local butchers. 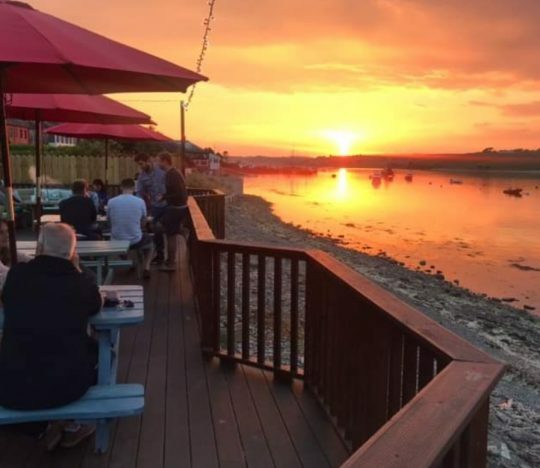 The cosy pub provides the perfect setting for experiencing Irish hospitality and our garden with a waterfront seating area sets the perfect backdrop for enjoying your visit to Courtmacsherry. David takes care of the front of house and Martin is the chef, looking after the food .We spent many years working in bars and restaurants in Cork, London and Dublin before deciding it was time to open our own business and where better than this lovely little village. We open for dinner 7 nights a week all year around and we also serve lunch 7 days during The Summer months. 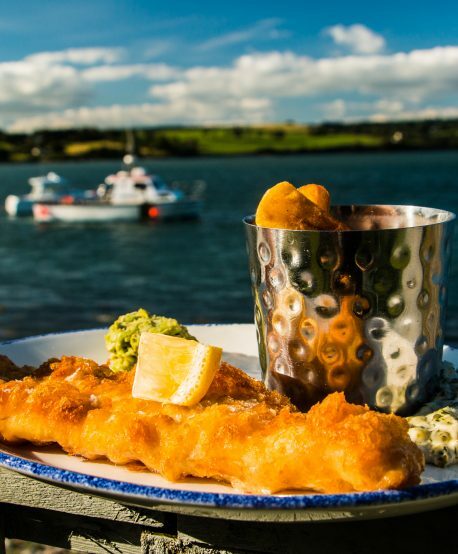 We’re located in the picturesque fishing village of Courtmacsherry, West Cork. Our tasty menu is highly regarded from local customers and tourists. See our menu page for the full menu. We offer the finest in locally brewed, craft and mainstream beers. Don’t just take our word from it, here are some kind words from our customers. 4 of us had Sunday lunch recently and really we were blown away with quality of the food, the nice friendly staff and the warm burning fire, I had home made soup and brown bread then the main course roast chicken with mash and fresh veg with a nice bite just perfect, and another thing is food has to be served piping hot and they really delivered perfect. I had hot lemon drizzle cake for desert again so tasty, the other people with me agreed as well superb food. Possibly the best fish and chip in the country with amazing hand cut chips. Lovely atmosphere and very reasonably priced. Have just eaten a beautiful meal in The Lifeboat Inn. The Restauraunt was booked out but the friendly staff facilitated us in the bar. The food was amazing , beautifully presented and served by efficient friendly staff. Definitely a place not to miss. 11 out of 10. Had dinner in the bar. Food was excellent. Fresh fish and home made desserts- delicious. The Gastro Bar is under new Management and the guys have really transformed the place. Great banter with some of the locals. Service was great. Staff really friendly. They have a lovely beer garden across the road facing onto the seafront. Great for Summer drinks and food. Can’t wait to go back. Highly recommend. The bar is under new management and I have eaten evening meals there several times since. I’ve had the steak, duck and fish of the day. All were delicious and all have been on very busy summer evenings but there was no delay and all were piping hot. There isn’t a massive menu here with 40 items. It means you get quality and the menu does change. The atmosphere is good, it is a village pub after all and there’s plenty of room in the garden across the road when the sun shines if you want to let the kids run around or you have a dog with you. If you have lunch, there is a place next door called Travara Lodge that does a vast variety of delicious cakes for afters! Have a question for us? Feel free to drop us a line by phone on +353 (0) 23 886 4656 or use the form below.